I have lot of Maharastrian friends here and they used to share with me many recipes. While talking about the Ganpathi celebrations in Mumbai, they were telling about the types of modakam they make too. Generally these khoya|mawa modaks they make in a different way. 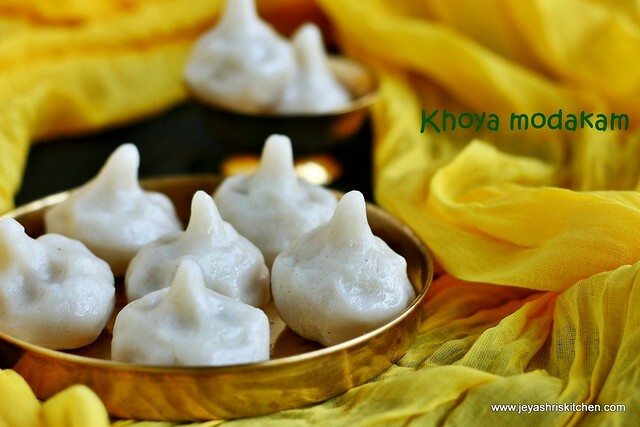 they make khoya|mawa pedas and using he modak mould they make them as modaks. I wanted to try this as our usual south indian kozhukattai. It turned out very well and we all loved it very much. 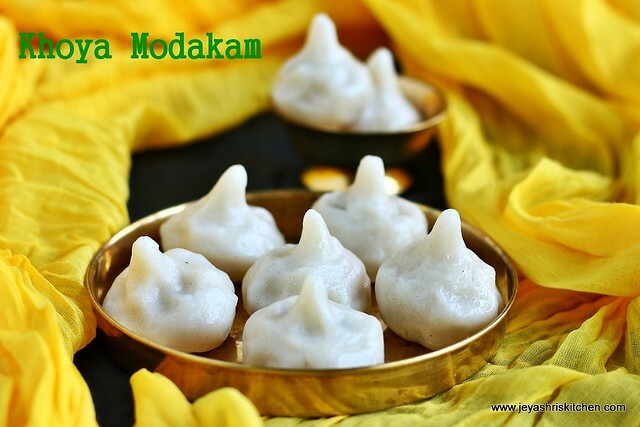 So for a change from the usual thengai poornam kozhukattai, try out this Khoya Modakam for Ganesh chathurthi 2015. Check out my video on how to shape modakam. Bring the khoya to room temperature. Crumble it with your hands. Add the dry coconut, sugar (you can powder if it is coarse), cardamom powder, finely chopped pistachios and saffron this. Mix this well with your hands. Do not add water or milk. The moisture in the khoya will be enough to make it into round balls. Take a small portion and make it into round balls. 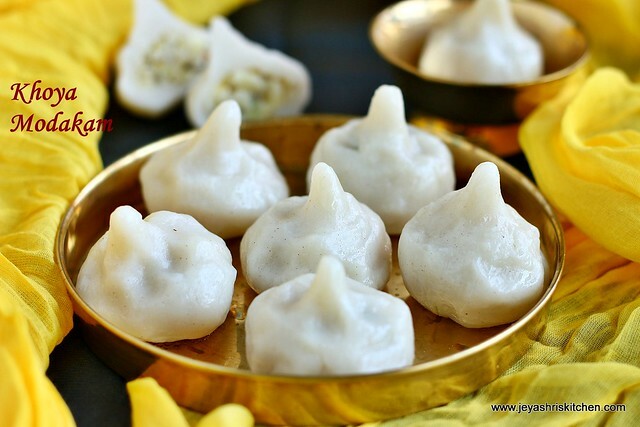 Maharastrians make this as the shape of modak and offer to ganesha as it is too. For me the measurement came out for exactly 8 round balls. Take the outer dough ball and grease you hands wiht oil and make a small cup out of it. Cover this carefully and make it into the shape of the modakam. Grease the idli pan and place the modakam on it. Steam this for 8-10 minutes til it gets a shiny texture on the outer cover. Once they are done, after 3 minutes take it out from the idli pan. Khoya modakams are ready for neivedhyam. The sweet was perfect for this modakam. If you want replace sugar with jaggery. Dry coconut can be replaced with fresh ones too. Always keep the outer dough covered, else it will become dry and the kozhukattais will get cracks while steaming. In Singapore we get Khoya in Mustafa center and in Chennai most of the Pahamudir Nilayam and Nilgirs have khoya.